The best cheap business class flights to Cairo from London we found for a client last month were for an amazing £1,249 return deal! To get today’s best price, simply complete the form on this page and we will get back to you faster than you can say “Giza Pyramids!”. British Airways and EgyptAir offer direct business class flights to Cairo from London. British Airways Club World provides dedicated check-in at most airports around the world and an exclusive AirPortr service that picks up your luggage from your London location for bag check-in. The Club World Cabin boasts spacious seats that recline into a full flatbed and a personal 10.4in flat screen with noise cancelling headphones for unrivalled rest and entertainment. British Airways has partnered with the British luxury lifestyle brand, The White Company, to offer stylish and luxurious bedding and amenity kits tailored specifically for Club World Cabins. EgyptAir offers golf cart transit service for getting around London Heathrow Airport and the warm and helpful flight attendants will ensure your flight is as enjoyable as possible. In-flight food service is a world-class multi-course experience that will leave you more than fulfilled! Note that EgyptAir does not carry alcoholic beverages, but you will not be disappointed by its non-alcoholic offerings available at anytime during the flight. Direct business class flights to Cairo from London land at Cairo International Airport. Hiring a taxi is the easiest way to get downtown and they operate on a flat fee. Cairo taxis are black and white, while Alexandria taxies are black and orange. Make sure you keep walking and avoid eye contact with the taxi drivers before you make your choice. For a premium, you can enjoy a ride downtown in a Mercedes Benz taxi. Consider arranging a transfer through your hotel prior to arrival. There are a few types of taxis available for getting around in the city. You will want to use the yellow taxis when possible, which work by reservation. You can ask your hotel to call an hour or two in advance to arrange one for you. If you want a taxi in a pinch, then try to hail a white taxi, which are revamped versions of the black and white taxis. These taxis are metered and it is not uncommon to tip the drivers. Pick up a few simple Arabic phrases and have your destination written in Arabic to have a smooth taxi journey! Do not waste business class flights to Cairo without a stay at the Four Seasons Cairo at Nile Plaza. Rub shoulders with Arab royalty and Western celebrities at this hotel that boasts some of the largest suites in Cairo, with sweeping views of the Nile. Complete the luxury experience with world-class restaurants and shopping at the Beymen Department Store, carrying top designer labels. If you prefer to be right at the foot of the Great Pyramids, then you have to check out the Mena House Oberoi Hotel. Stay in stately 18th century suites or modern 20th century rooms, which have by graced by the likes of Charlie Chaplin and Winston Churchill. The peaceful garden surroundings offer a respite from a day of sightseeing. You can tell your friends that you swam in the pool under the shadow of the Giza Pyramids. 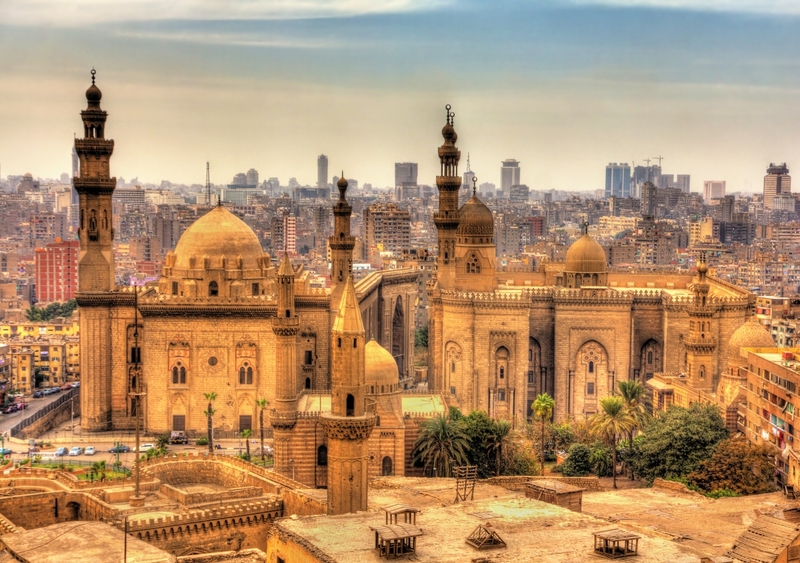 Old City (Coptic Cairo) – The oldest part of the Cairo was the Roman stronghold of Babylon as well as the heart of Egypt’s Coptic Christianity. The area features five original Coptic churches, the oldest mosque, and the oldest synagogue. Dahshur – Visit the ruins of early pyramids and learn how the form developed. Some tout this as a more interesting visit than the Giza Pyramids! Mohammed Ali Mosque – Often compared to the Blue Mosque in Istanbul, take your time at this 19th century Ottoman-style mosque located in the Citadel. Spectacular – Do a quad bike plus camel ride tour through the desert and across pyramid ruins. Admire the ancient tombs basked in dawn’s first light. Sea and Sailing – Take a cruise along the Nile and learn about this historical river that gave rise to one of the earliest human civilisations. If you have time, take a multiday cruise, from Aswan to Luxor and experience the highlights of Egypt. Sky – Take your Cairo trip to the next level by skydiving over the pyramids! Scuba – The closest site to dive is Alexandria, about two hours driving from Cairo. Alexandria offers an alternative experience to the popular Red Sea, where divers can explore ancient ruins left by pharaohs, Romans, and Greeks and modern ruins from World War II airplane wrecks. Summits – If you have time for a longer trip, complete your Egypt experience by summiting Mount Sinai. At 2,284 metres elevation, it is a holy summit in Judeo-Christian religions, as the site where Prophet Moses received the divine commandments. British passport holders may apply for an e-visa on the website of Visa2Egypt. Tourist visas are granted for stays up to 3 months. Your passport should be valid for at least six months from your date of entry into Egypt. Though it is still possible to get a tourist visa upon airport arrival, it is advisable to get an e-visa beforehand, in particular if you are travelling for work or business. Visas granted upon arrival are available for a maximum of 30 days. Please make sure you carry your authorised prescriptions as some prescription and over-the-counter drugs available in the UK are controlled in Egypt. Also note that certain valuables such as electrical equipment including video cameras and satellite phones must be declared upon arrival or face confiscation. Contact the Egyptian Embassy in your resident country to learn more. While the peak months are the winter months running from December to February, the best time to visit Cairo are the spring and autumn months, i.e. March, April, October, and November. During these pleasant months, daytime temperatures range from 22-29 degrees Celsius. In April, there is also the Ismailia International Film Festival and Cairo Fashion Week. Then in November, you may be able to catch the Cairo International Film Festival and the 100km Pharaohic Race. To get the best cheap Business Class flights to Cairo, simply complete the form on this page or call 0044 207 255 1234 to speak with one of SkyClub’s fast and friendly experts. We will find you special, discounted fares that are not available online. So, by the time you take your business class flights to Cairo, you’ll feel happy knowing that you’ve paid less than the person sat next to you! Have a great trip and – if you want to save money – please book with SkyClub.